Topics: Airport Services, Business And Meeting Services, City-to-city, Weddings, Parties, and Evenings. 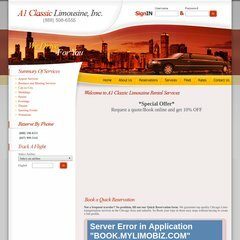 a1classiclimo.com A1 Classic Limousine, Inc.
On average 2.80 pages are viewed each, by the estimated 54 daily visitors. The programming language environment is ASP.NET. ns1.colo4dallas.net, and ns2.colo4dallas.net are its DNS Nameservers. It is hosted by American Registry For Internet Numbers (Virginia, Chantilly,) using Microsoft-IIS/7 web server. PING www. (98.129.229.51) 56(84) bytes of data. A ping speed test response, is timed at 35.6 ms.